This bath mat couldn’t really be easier to knit or more satisfying to complete. You end up with a real life, fully functional bath mat! Pretty cool! It’s made out of easy-to-care-for cotton and has a perfect thickness and density to it. It makes me feel like I just snuck into a Ritz Carlton! The yarn is doubled throughout this pattern. When you are using an even number of balls (for example, the interior of the bathmat uses 2 balls of yarn), just pull one strand from each ball. When you are using an odd number of balls, you have a couple of options. One is to pull one strand from the center of the ball and one strand from the outside of the ball (my preferred method). The other is to wind the one ball into two balls as evenly as possible. With two strands of Color A (see the Materials section) and the 32 inch needle, cast on 56 stitches. Repeat Rows 1 and 2 until piece measures 10 inches. With the right side facing you and using 2 strands of Color B and the 32 inch needle, pick up 1 stitch at the right corner of the bound off edge. Pick up 54 stitches along the bound off edge. 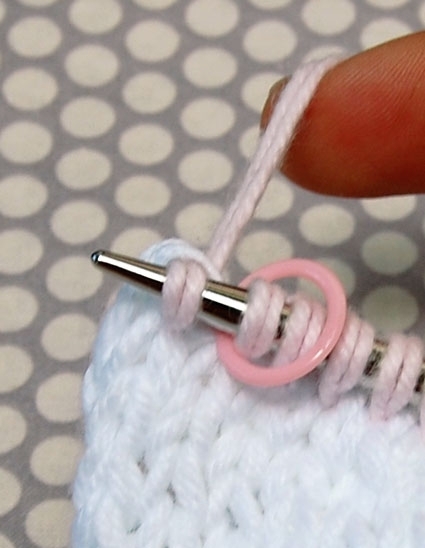 Place a marker, and pick up 1 stitch at the corner. Pick up 38 stitches along the selvedge edge (about 3 stitches for every 4 rows). Place a marker, and pick up 1 stitch at the corner. Pick up 54 stitches along the cast on edge. 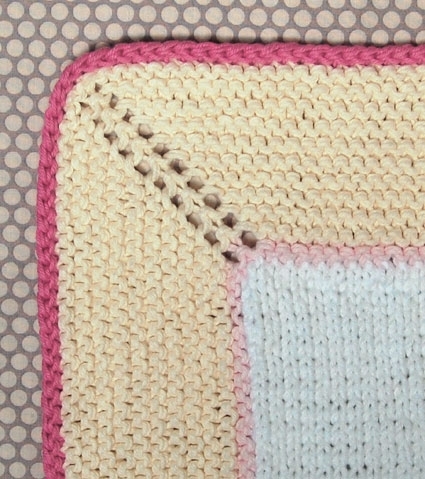 Place a marker, and pick up 1 stitch at the corner. Pick up 38 stitches along the second selvedge edge. Place a different color marker, indicating the beginning of the round. You should have a total of 188 stitches. Round 1: Joining for working in the round, purl. Change to 2 strands of Color C.
Repeat the last 2 rounds until the border is 3 inches wide, switching to the 47 inch needle when necessary. End with a purl round. Change to 2 strands of Color D.
Knit 1 round, without increasing at the corners. 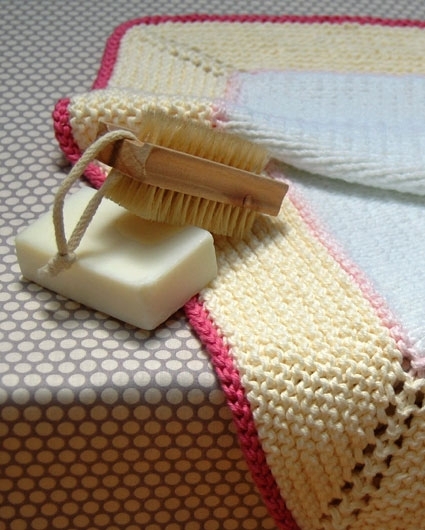 Sew in the ends and block your new bathmat! That is so sweet looking! I love the colors you picked, too. This is a charming little project. Your tutorial is like having my mother sitting by and showing me how to do different stitches. Thank you for that. This project looks great, but I wonder how many stitches I could add to make it bigger. What do you think of the idea? Great idea! 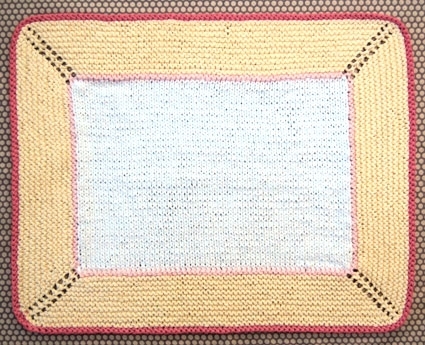 The interior rectangle of this bath mat is 14 inches wide and 10 inches high and the border is about 4 inches wide. So, decide how big you want your bath mat, subtract 8 (for the borders) and multiply that number by the gauge (which is 4). 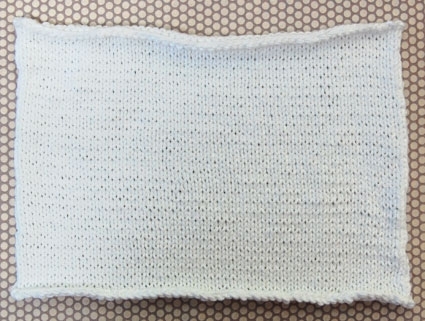 For example, a bath mat 30 inches wide: 30 minus 8 inches for the border (22) times 4 for the gauge equals 88 cast on stitches. 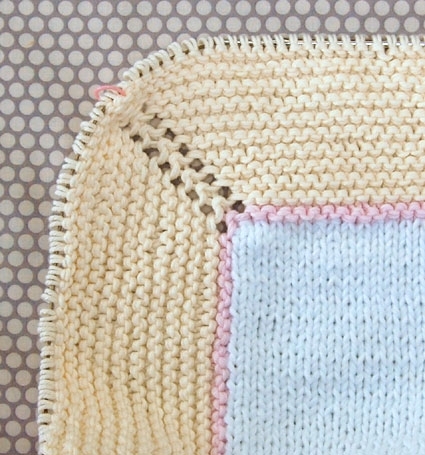 Don't forget to pick up more stitches for the border (one stitch for every cast on and bound off stitch and 3 stitches for every 4 rows along the edges). And you'll also need more yarn! I hope you enjoy your BIG bath mat and good luck! You have the best tutorials I've seen online! Your ideas are great and the execution of them is flawless – thanks. looks good I'll try my hand in it,soon. Is there such a thing as a 47″ circular needle? I have a set of Hiya Hiya interchangable and the largest is 40-42 on the cord so are you including the length of the needle with that? Why should I even mess with the 32 if I have a 40-42? I'm a new knitter so please don't be offended by my ignorance….I really want to know why I would switch cords. Why not just start out with the bigger one. BTW, I am making this. I have all the yarn and everything. I am following your yarn and colors to a “T”! Love it! There is such a thing as a 47-inch circular needle, and yes, it is measured from tip to tip. 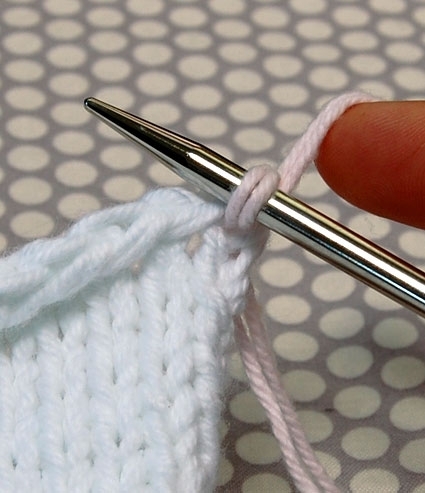 The reason for the two cords is that the number of border stitches grows as you knit. So at first, 32-inches easily accommodates the number of stitches you're working, but then your needle gets very crowded and you switch to the 47-inch. That being said, you may get away with using just your 40-inch circular for the entire border. It may just be a bit of a stretch at first and then a bit of a squeeze at the end! I hope this helps! Thanks for your question! I can never get the picked up stitches to look as neat as in the picture, any tips? I struggle with the end of rows edge and I slip the last stitch on every row. I think the most important thing for picking up stitches is consistency. So, when you've decided exactly where in a stitch you're going to pick up and how often, stick with your decision the whole way through! 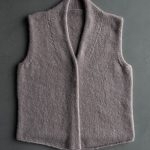 But, ultimately, neat pickups come from practice and experience, knowing the anatomy of knitting and having picked up lots of messy stitches along the way! When working the border, at what point do you join the work in the round? Is it when you pick up the stitches? Or on the first purl round? 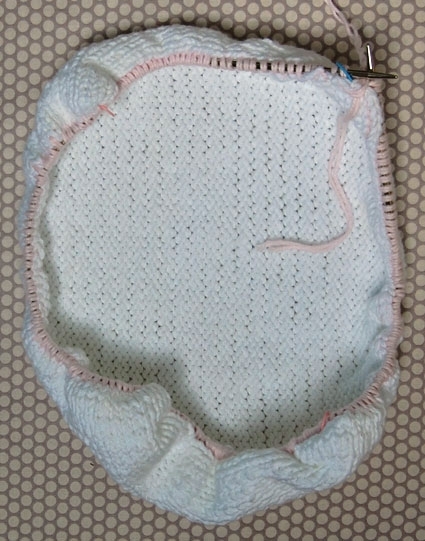 I am having the hardest time and have torn out the border twice…three of my corners look perfect but the one at the start of the round just is not right. Very good question! I added some clarification to the pattern, but to answer your question here… You actually join for working in the round when you make the first purl stitch of Round 1. I hope this helps get you on the right path. If not, please let us know and we'll work it out! Thanks so much for pointing out that the pattern wasn't clear on this step and good luck! I love my knitted bath mat! Thanks for the pattern. This is beautiful…I’m looking to make a kitchen rug…can I use this pattern? If so yarn recommended…if not pattern suggestions. I think this would be great as a kitchen rug! I’d probably just suggest finding a worsted weight machine washable yarn – you can browse our selection of superwash wool here! 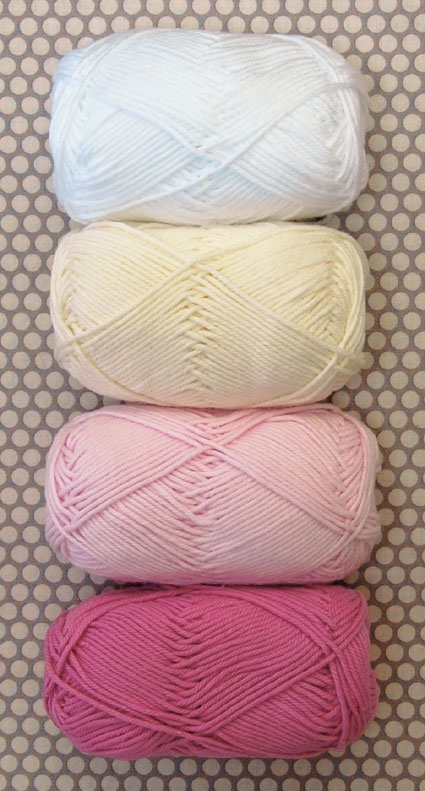 Or you can use the Blue Sky Cotton, which you can find by clicking here!